I've been lusting over these Dsquared2 sunnies for quite some time now, and since they're not only sold out everywhere, they're a little bit (er, a lot) out of my price range. Meaning, the only obvious solution would be to DIY them, am I right? So of course after months of pondering the idea, I finally got a slate of free time and up-cycled a pair of my trusty sunnies and voila, Embellished Sunglasses. So grab your glue and those old sunglasses and let's bedazzle our sunnies, after all, it's one of Spring 2013's trends to love. Lucky for you this one is not only easy, it's a quicky. What a fun idea! They look great and definitely add glam to your outfit! this is amazing! i wanna try! Wow! You did these so well. Great result. Love this idea! Not only does it not break the bank but it also adds a level of unique! Great post, always love coming by your blog. Very chic and elegant outfit, love the colour of your top. What a fun idea! I've seen similar DIYs with mini roses, but I love these jewels you chose! Super cute! And I love the shape that was made on the finished pair! These are gutsy, but I love them! Very cute! And so easy! And I'm loving your top too! Great idea!! I need to do this to a cheap pair or 2 that I have lying around!! Those are super cute!! Love them! WoW it is a wonderful model of glass ! Let come to see my new Post !!! I wait you :-D Kiss from Italy ! Oh I love them! They look so cute! I am definitely going to try it. You have inspired me. I love your look too. I love that oversized tee! Love your sunglasses Megan. A great idea! Little Miss Creative!! I would have never thought of this, great idea! Loving your outfit too! Looks so comfy! Super cute t-shirt! Love how it just blows away in the wind! Also, your sunnies, they are amazing! This is such a great DIY. I love it! WOW, amazing DIY, love it! what a gorgeous look! I love the sunglasses! Love this idea... I might just have to try it out over the weekend! what an awesome idea! yours look fab! The glasses look awesome, how fun! you always do the best (and also most do-able) DIY projects. dig it. Thanks for your visit..Have a great Friday! Love those! Great diy, and you look gorgeous! Oo, this is a great DIY idea. I love me some embellished sunnies and these seem like an inexpensive way to get some! I love your DIY sunglasses. They look amazing on you too. I like your version of the glasses more, yours look so wearable and cute! I'll have to give this a try with my daughter, she's obsessed with sunglasses and glitter so this would be a ton of fun. LOVE this! I was checking out that shirt at Top Shop... I am so getting it now! 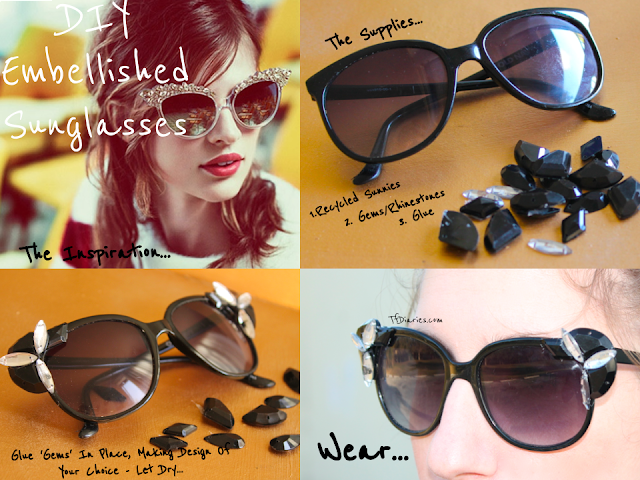 What a great idea, I have a few sunnies that I don't wear a lot anymore and this DIY is the perfect way to update them! Love this idea! You can never go wrong with a little extra sparkle! Awesome idea! I love the finish result, came out great. Such an amazing DIY and something I can actually do (I'm not crafty in the least)! I'm definitely going to have to give this a try! perfect outfit!! the DIY is incredible! Too too too super cute. They turned out awesome!